Anyone else seeing webpage adverts for Reyrgear rods on various websites you visit? Today it appeared on a couple of websites I frequently read. The large print - Better Than Tenkara - A new combination of tenkara rod & traditional fly rod styles. The best of both. Usually I avoid clicking on webpage ads. But I kept seeing it so frequently I finally clicked on the ad just to see what it was. The cat’s curiosity. Basically it is a Japanese style inter line rod. 8.5 ft (2.59m) extended length with a fly reel. 17 inch (43cm) collapsed length. Explaining that Reyr (rair ) is Icelandic word for reed or pole. Better than tenkara? ah Nay Nay. Just a different kind of western fly rod, imo. I think it doesn’t belong in a discussion about tenkara rods. I was just curious if anyone else here is seeing their advert popup on websites you visit. I assume google tracks people who look at tenkara websites, and push this ad onto other unrelated websites they visit. Fortunately, I’ve never seen their ads pop up anywhere (yet). I do see them on Instagram because they use the #tenkara hashtag in their posts - and I like to navigate around topics I enjoy on IG via hashtags. Wish them luck, but not for me. Don’t really see the benefit over a fly rod that breaks down into 4 sections other than perhaps the extra 5 minutes it might take to string up a regular fly rod. Definitely not tenkara in any way. Looking at some of the Reyrgear website links to websites that focus on highlighting new gadgets Reyrgear rods appear to have began about mid 2018. Many people draw a small box and say only the type of rods, tackle, fishing tactics, targeted fish, and place of fishing within the box is tenkara. Anything outside that box is not tenkara. I would say what is inside that box is a strict definition of historic traditional tenkara, with a much large box surrounding it that is modern evolving tenkara. But the edge of that larger box, outside of which is clearly not tenkara, is a fuzzy line, what in my former profession was called “penumbra”. Wherein activity is a little bit tenkara and a little bit not what people would consider tenkara. Things such as people I’ve seen in Japanese blogs or videos who fish in a way that would be recognized as tenkara fishing. Only they have modified an inner line rod for the purpose. Or people who have added some kind of cranked small reel, either a manufactured reel or self made reel, or just a permanently attached line spool of some kind to a rod marketed as a tenkara rod. The only commercially sold rods I’ve seen that are called tenkara rods, that is a similar idea to the Reyrgear rods are the rods made and sold by Kashiwagi Shigetaka-san [柏木重孝さん]. I’ve seen his style called hybrid-tenkara. Not the usual idea of what a tenkara rod is. However, Kashiwagi Shigetaka-san is an interesting guy who was a well known celebrity bass fishing angler. 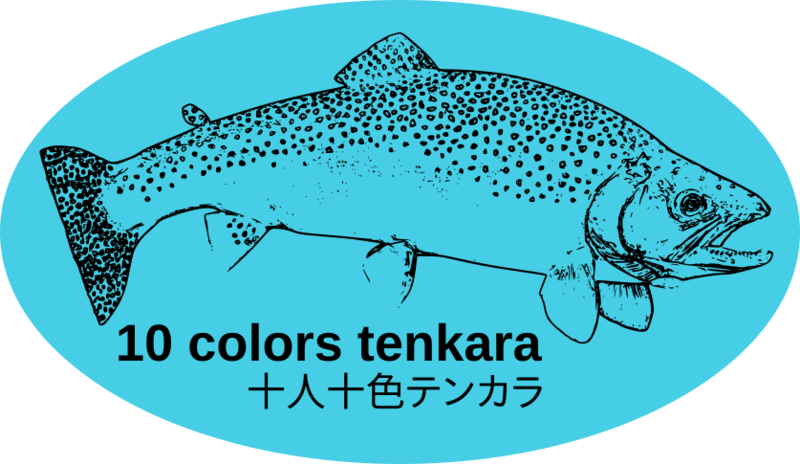 Authoring books, and videos about bass fishing, and I think developer of ZEAL lures before turning to developing his style of hybrid-tenkara. You can find his rods, kebari and other accessories sold on numerous websites. Usually with the name, 柏木流 , Kashiwagi-ryū, Kashiwagi style. Or 柏木流テンカラ. He has a fun blog, you can see his rods on his blog, too. Basically they are not a lot different from the Reyrgear rods, about the same length, an inner line rod, only the excess line is stored by manual winding the line onto a line spool that is part of the handle design. And his rods are pretty pricey, $800 +/- . 9 years ago I happened to find a fun video with this title. 毛バリバリ伝説2 . I do not know how to correctly translate the title, other than as Kebari Baribari Legend 2. If I understood spoken Japanese better I could more fully appreciate the intended comedy in his self debate about the difference between the words Tenkara and Kebari, テンカラ and 毛バリ. The man in the video is a celebrity entertainer, stage name 松山 三四六 [Matsuyama Sanshirō] or Matsuyama 346. The YouTube title of the video, 毛バリバリ伝説2, also seems to include a subtle bit of word play and the deeper joke about it also eludes me. 毛バリ is kebari. But if you do an internet search for バリ伝説 - You will find animated or real videos or comic books about motorcycling. With titles similar to this one - バリバリ伝説アメリカＧＰ編part3 , Baribari Legend (or Legendary ) American GP (edited?) part 3. They seem to be a popular series. I am thinking that Matsuyama 346 is a character in some of the バリ伝説 shows. More about that later. The video was uploaded onto YouTube, Aug 19, 2011, on YTC abn5ch, that I am guessing is a tv channel in Japan. Sometime in 2010, Dr. Ishigaki made a blog post, url 346, but the blog title is almost the same as the YT video title, 毛バリバリ伝説 . I could be wrong, but the subject of the blog post appears to be that Matsuyama 346 and tenkara will be featured in an upcoming episode of the バリ伝説 shows. Anyway, different people place the dividing line between what is tenkara and what is not tenkara. My view is where ever they place the line, it should only matter to themselves. For me yeah, the Reyrgear rods may be fine rods, but they are outside the box I consider to be tenakra, or the spirit of tenkara. Or these type of rods. インターラインでテレスコのロッド , Intārain de teresuko no roddo, Interline telescopic rods. バリバリ 伝説って何 What is Baribari Legend? If you’re a motorcycle guy, you might find them kind of fun. The Honda CB 750 is one of the stars of the shows, one of the hot bikes to own 30 ~ 40 years ago. A bike probably at the scene of many accidents of guys riding well above their riding skill level, too. Kebari Baribari Legend is also found. The latest “Kebari Baribari Legend” is completed. 346 was addicted to (hooked on) tenkara. That’s where Mr. Tatsumi Fukushima was introduced. He is a mountain master who has the nickname “Tarzan of Norikura”. I have this rod. Got it recently. I did not come to Tenkara from a fly fishing background and over this winter I got curious to try a rod and reel… I now have two…my first was a 4 piece 2 wt…which I have enjoyed fishing with a few times. I then opted to try this Reyr Rod out as a 5ish wt option. The only Tenkara rod common feature is that it telescopes. In terms of fishing technique you can of course apply tenkara like methods with any western rod and reel if you choose. I have only lawn casted the Reyr rod so far and it feels great…a medium action and the line moves nicely through the center of the rod. Collapsing it and setting it up is indeed easy. In part I agree with @troutrageous1 it is not that hard to set up a 4 piece rod and rig it…but…I will say my 4 piece which is a 7.5 foot rod does not collapse as small and compact as the Reyr rod. When collapsed this thing is close to my Shimano Pack Tenkara. It all fits nicely in a neoprene case. It is literally a toss in your carry-on suit case, stuff in the pocket behind your car seat kind of size. It comes apart easily for cleaning and drying. The other thing about how it collapses fully rigged and without needing to remove the fly makes it nice like a tenkara rod to move from spot to spot on the stream bushwhacking on shore and not risking breaking the rod or tangling your line. Although I think in most of the places I know like this I’ll be bringing my fixed line rod. I mostly bought this for travel…and random fishing opportunities that might pop up quickly for larger or warmer/still water. If people are interested I’ll report back after a day on the water with it. Ah, I have found the origins of the - tenkara / kebari - confusion debate in the 毛バリバリ伝説2 youtube video. 三四六：そもそも毛鉤って何？346: In the first place what is a kebari? のっす：テンカラです。-------- Nossu: It is tenkara. Kebari Baribari Legend ! 346 meets / encounters special forest and water spirits. The meaning of ぎゃふん, gyafun, in the text is a mystery. ぎゃふんって何 [ギャフンって何] , What is gyafun? Thank you for the gyafun explanation.